Undoubtedly, Europe has the most extensive and best studied Paleogene fossil record of birds. Recent reviews were conducted by Mlikovsky (1996a, 2002) and Mayr (2005a), and in the following only major localities which yielded significant numbers of avian remains are listed. Comprehensive data on most European fossil sites where Cenozoic bird remains have been discovered can be found in Mlikovsky (1996a). The European Paleogene is subdivided into biostratigraphic units of the Mammalian Paleogene (MP), whose definitions are based on local mammalian faunas (Legendre and Leveque 1997). According to this stratigraphy, the Paleocene covers the units MP 1-6 (ca. 65-55 Ma). The Eocene comprises the units MP 7-20, of which the early Eocene (Ypresian) includes MP 7-10 (ca. 55-50 Ma). The middle Eocene is split into the Lutetian (MP 11-13; ca. 50-42 Ma) and Bartonian (MP 14-16; ca. 42-38 Ma), and the late Eocene (Priabonian) covers MP 17-20 (ca. 38-33 Ma). The Oligocene contains the units MP 21-30, with the early Oligocene (Rupelian) being from MP 21 to 24 (ca. 33-29 Ma), and the late Oligocene (Chattian) from MP 25 to30 (ca. 29-23.5 Ma). Very little is still known on Paleocene avifaunas of Europe. Although hundreds of Paleocene bird bones were found in the Walbeck fissure filling in northern Germany, these remained unstudied for almost 70 years (Weigelt 1939; Mayr 2007a). The Walbeck avifauna is comparatively species-poor and its exact age is uncertain, but is probably late middle Paleocene (?MP 5; BiochroM'97 1997). In the mid-nineteenth century, late Paleocene (MP 6) birds were further described from the deposits of the Reims area, i.e., Cernay-lès-Reims and Mont Berru, in France (Hébert 1855; Lemoine 1878, 1881). The fossils from these localities also consist of isolated bones and the avifauna is dominated by very large forms. By contrast, the early and middle Eocene European fossil record of birds is extensive, and numerous new taxa were described in the last two decades. Study of one of the earliest localities, the early Eocene (MP 7; 55-54 Ma) sediments of the Fur Formation ("Mo-Clay") of northwestern Jutland in Denmark, has only recently begun. Although the sediments from these deposits consist of marine diatomites, most avian taxa belong to land birds. Several of the fossils are represented by virtually three-dimensional, hardly crushed skeletons (Kristoffersen 2002a; Lindow and Dyke 2006). Most avian specimens from the slightly younger London Clay in southern England come from two localities, the Isle of Sheppey (MP 8-9; Mlikovsky 2002) and Walton-on-the-Naze (MP 8; Mlikovsky 2002). Many of those from the latter locality are in the private collection of Michael Daniels (Daniels 1988, 1989, 1990, 1993, 1994; see Table 4.1 in Feduccia 1999 ). Fossil birds from the London Clay were collected in the nineteenth century, and actually the first two fossil avian species named scientifically, Halcyornis toliapicus Koenig, 1825 and Lithornis vulturinus Owen, 1840, are from the Isle of Sheppey. Although the London Clay Formation is of marine origin, it yielded a great number of terrestrial and arboreal birds, which lived in the forests near the shoreline. Most fossil specimens consist of three-dimensionally preserved bones, and often even partial skeletons are found. The taxonomy of these fossils is, however, much complicated by the fact that numerous very fragmentary and noncomparable bones were named by earlier authors (see Steadman 1981 for a critical review). Middle Eocene fossil birds were further recovered in the now abandoned opencast brown coal mines of the Geisel Valley (Geiseltal) near Halle in eastern Germany (Mayr 2002a). The fossiliferous deposits of these localities pertain to different stratigraphic horizons (MP 11-13; 44-46 Ma) and originated in peat bogs and small lakes (Krumbiegel et al. 1983). Some fossils from the Geisel Valley also show exceptional soft-part preservation, including even epithelial cells with nuclei and red blood corpuscles (Voigt 1988). 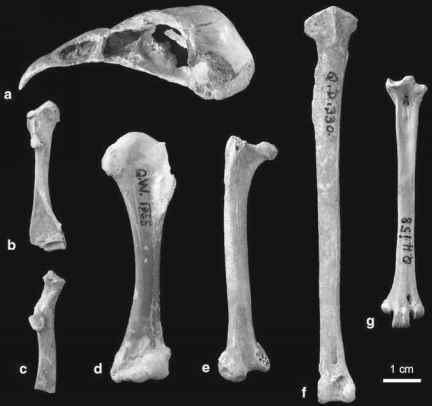 The "Phosphorites du Quercy" in France have yielded a large number of middle Eocene to late Oligocene (MP 10/11-28) bird bones, which accumulated in karstic fissure fillings (Mourer-Chauviré 2006). Many fossils were found during phosphate mining activities in the nineteenth century and lack accurate locality and horizon information, but numerous bones from later excavations in the second half of the twentieth century could be ranked stratigraphically. The deposits of the Quercy fissure fillings originated in different paleoenvironments. Most avian taxa were either terrestrial or arboreal, whereas aquatic birds are very rare. The more than 70 named species were listed by Mourer-Chauviré (1995a, 2006). The Quercy deposits are of particular importance not only because the avian remains are very well studied, but also because of the great number of three-dimensionally preserved bones, and the wide stratigraphic range they cover. Virtually all specimens consist, however, of isolated bones, and an unambiguous assignment of different postcranial elements to the same taxon is sometimes difficult. Late Eocene (MP 19; Mlikovsky 2002) birds were described from the Paris Gypsum in France (gypses de Montmartre). Most of these are represented by articulated skeletons but are so poorly preserved that only very limited osteological comparisons are possible (Brunet 1970; Harrison 1979a). A late Eocene (MP 17; Mlikovsky 1996b) avifauna is also known from the Hampshire Basin in southern England, and a number of early Oligocene (MP 21-23; Mlikovsky 1996b) birds was discovered in the Hamstead Beds of the Isle of Wight (Harrison and Walker 1976a, 1979a). Avian remains from early Oligocene (Rupelian) deposits in Belgium, which were published in the nineteenth century, are based on a few isolated bones and the remains mainly represent marine taxa. More recently, earliest Oligocene (MP 21) avifaunas were reported from the fluviolacustrine Belgian Boutersem Member (Mayr and Smith 2001, 2002a). Well-preserved skeletons of early Oligocene birds were further found in the locality Wiesloch-Frauenweiler in southern Germany. This former clay pit is well known for its Rupelian (32 Ma; Micklich and Hildebrandt 2005) marine fish fauna, but because the sediments stem from a near-shore environment it has also yielded a diverse array of small arboreal birds (Mayr and Knopf 2007a, b). Other important localities for early Oligocene birds are situated in the Lubéron in southern France. Most fossils from this area stem from the Calcaires de Vachères in the region around the villages Vachères and Céreste. They are represented by skeletons in fine-grained limestone, which originated in brackish coastal lagoons (Mayr 1999a; Roux 2002; Louchart et al. 2008).